Use this vanity to bring more modern style into your bathroom. Its beige tan marble counter and brown solid wood base are very easy on the eyes. Made with a roomy single-door cabinet and drawer, this vanity has lots of room to keep items like toothpaste, towels, and hair brushes. Put together your perfect bathroom with this stylish vanity set from Wyndham Collection. Bring a fresh, modern look into your bathroom with this vanity. The good-looking beige tan marble counter and brown solid wood base make a big difference in your bathroom. Its single-door cabinet and drawer have lots of room to keep all of your bathroom items. Put a classic feel in your bathroom with this good-looking set from Wyndham Collection. This vanity has both an all-around look and a modern style. With a beige tan marble counter and brown solid wood base, this product is good-looking and useful. With drawers and double-door cabinet, this vanity set is also great to keep items in. This classic set from Wyndham Collection will make your bathroom look brand new. This vanity is a great way to add modern style to your bathroom. The beige tan marble counter and brown solid wood base make this piece great for any bathroom. With a double-door cabinet and drawers, this vanity can hold all kinds of bathroom items. This classic set from Wyndham Collection will make your bathroom look brand new. For a bit of modern style in your bathroom, choose this beautiful vanity. Its beige tan marble counter and brown solid wood base are very easy on the eyes. Keep many bathroom items in its roomy drawers and double-door cabinet. Bring a classic look and feel to your bathroom with this beautiful set from Wyndham Collection. 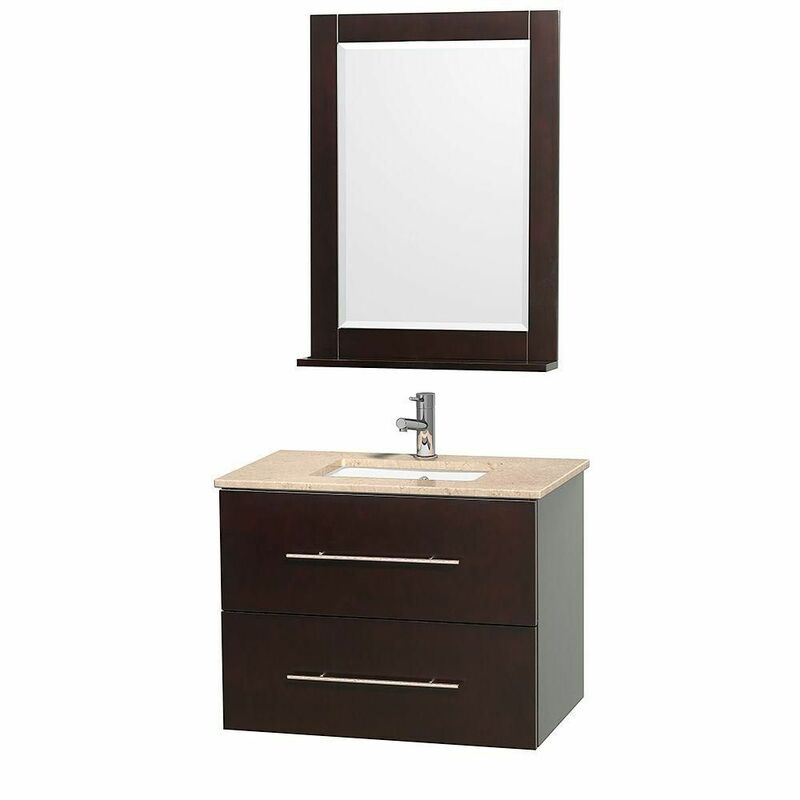 Centra 30-inch W 1-Drawer 1-Door Wall Mounted Vanity in Brown With Marble Top in Beige Tan Use this vanity to bring more modern style into your bathroom. Its beige tan marble counter and brown solid wood base are very easy on the eyes. Made with a roomy single-door cabinet and drawer, this vanity has lots of room to keep items like toothpaste, towels, and hair brushes. Put together your perfect bathroom with this stylish vanity set from Wyndham Collection. Centra 30-inch W 1-Drawer 1-Door Wall Mounted Vanity in Brown With Marble Top in Beige Tan is rated 4.0 out of 5 by 1. Rated 4 out of 5 by Precious from This set is beautiful. It looks really "hi end". It is a great value and well worth the price. ... This set is beautiful. It looks really "hi end". It is a great value and well worth the price. Similar vanities at other retailers cost a lot more. There is another option to buy this without the mirror but I am glad I got the matching mirror. I loved how it looks together and did not want to go searching for a matching mirror. It arrived within ten days of ordering. It was very well packaged. The marble top is not exactly what I would call Ivory. It had a blush undertone to it. I am glad I waited to order the tiles for my bathroom until after I received the vanity. I got similar tiles at Home Depot for my shower and bathroom floors that match very well with this vanity and the price was very reasonable. My contractor had to cut holes in the back of the vanity and in the fist shelf underneath the sink for the plumbing. There was a slight blemish (could have been an imperfection in the marble) and a scratch in the marble on the counter top.I called customer service right away and they were great. They offered to send me a replacement countertop. I did not have time to wait for a replacement as I was starting my renovation. Home Depot did make this right by giving me a discount. I was satisfied with this since I love this vanity. It has a really modern look to it and will fit in any modern or transitional style home. There is not a lot of storage but there is enough for the basics. I was able to store extra toiletries and a blow dryer on the first shelf and I put two baskets on the bottom shelf to hold face and hair products. They do also have the option of a matching storage cabinet that goes over the toilet but I skipped this since it is a small bathroom and I like the airy feeling with less furniture. I have only had it for two weeks so I can't comment on durability but it looks and feels like it will last awhile if it is taken care of.